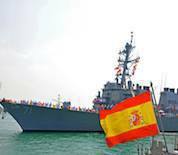 Naval Station Rota is located in the Province of Cadiz in Rota, Spain. The base is commanded by Spain but funded by the United States. Units from the Navy, Marine Corps, Army and Air Force are all found on base, making it the largest American community in Spain. The mission on base is to serve the United States and NATO by maintaining the base's facilities and supporting units within Spain and Portugal. The Passenger Terminal at Naval Station Rota is a popular destination for Space A travelers. The town of Rota is situated on Spain's Atlantic Coast and has miles of beautiful beaches. Morrocco is also only a short ferry ride away. This NS Rota directory features the critical info you’ll need to navigate through the many facilities and recreational opportunities available on base.